John Mulaney married his fiancee Annamarie Tendler on Saturday, July 5, Us Weekly can exclusively confirm. The former Saturday Night Live writer and the makeup artist and author tied the knot in Boiceville, NY at the Onteora Mountain House. In lieu of a wedding gift, the bride and groom asked for guests to donate to the Innocence Project, which helps wrongfully convicted individuals through DNA testing. The writer took to his Instagram following their nuptials to share an intimate snap from the big day with the caption: "July 5, 2014. On a beautiful and perfect day, I married a beautiful and perfect woman. I wish I could live it over and over again. (taken by @jessepafundi)." The new spouses first met years ago during a Massachusetts getaway. "After a group vacation to Martha&apos;s Vineyard, John rode shotgun while Anna drove a carload of people home," the couple shared on their wedding site. "He did bits the whole ride and killed. They were not dating at the time, but Anna knew they would be soon after." Mulaney has kept mum about his relationship for the most part. However, he did tease last year that his hairstylist love gives him free haircuts during a New York magazine interview. 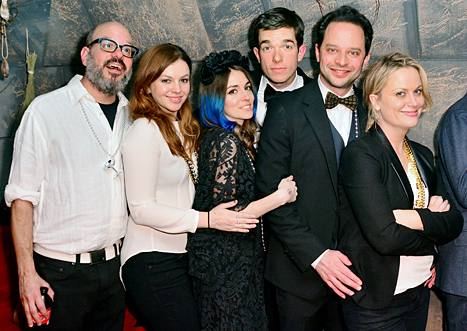 In December 2013, they also attended the Sleep No More New Year&apos;s Eve Party in NYC with friends Kroll, Poehler, David Cross and wife Amber Tamblyn. Before his years at SNL, Mulaney—who celebrated his bachelor party in Las Vegas in May—worked as a Comedy Central intern. Up next, the actor-comedian is slated to star in his own FOX comedy, Mulaney.